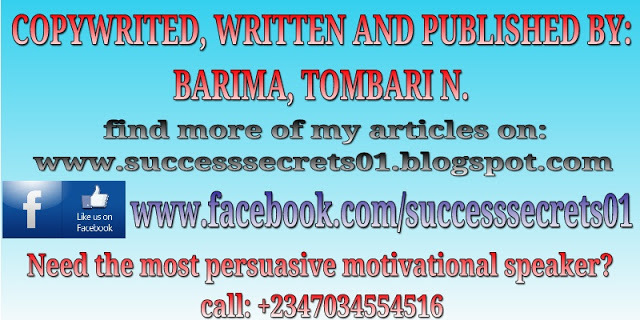 Happy new week dear success seeker. 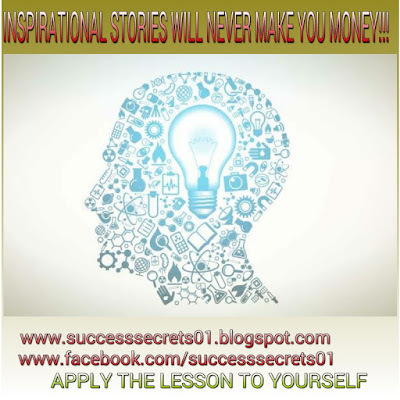 SUCCESS SECRETS trusts you had a good night rest and you are firing on all cylinders for the new week. We rejoice with you and we are wishing you more success. But more than just wishing you success, we also want to help you succeed! Here is our weekly energizer to energize you for even more success this new week. The quote for today's weekly energizer comes from Bob Proctor in his personal development program called The winner's choice: 12 power principles for winning the mind game. 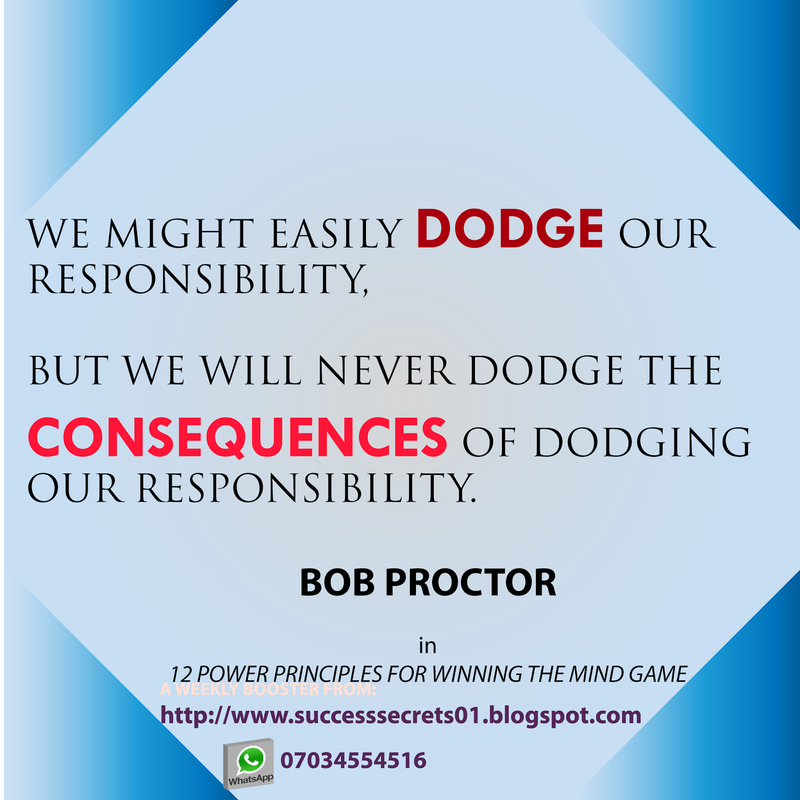 WE MIGHT EASILY DODGE OUR RESPONSIBILITY, BUT WE WILL NEVER DODGE THE CONSEQUENCES OF DODGING OUR RESPONSIBILITY. 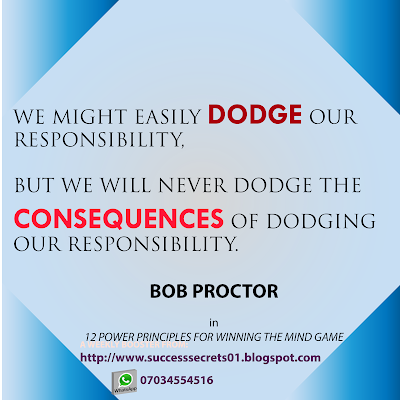 This quote of Bob Proctor is very apt for our consideration as we begin this new week. While it might seem exhilarating after an ephemeral analysis that we are able to dodge our responsibility, the truth is that taking responsibility is where our freedom actually lies. When we take responsibility, we put ourselves in a situation where we call the shots in our own lives despite the external circumstances. If we let ourselves off the hook and play the blame game by passing the buck, the truth is that our lives will remain whatever the person we have passed the buck to makes of it. Who can design a better life for us than ourselves? I will suggest we take responsibility for everything in our lives today so that we can enjoy the rewards sooner or later. This analysis is correct both for individuals, families, religious organizations, corporations or communities. As the weekly energizers are not meant to be long, I will use the trending issue of the OZUBULU MASSACRE OR OZUBULU MASS KILLING to illustrate how this concept of responsibility affects organizations and communities. Before I do the analysis, let me clearly state that I condemn the Ozubulu massacre in strongest terms. Such act is barbaric and even demonic. The mere thought of such depravity exudes utter disrespect for the sanctity of human life that will make the devil cringe. My heart goes out to all those who lost loved ones and I pray that the soul of all the faithfuls departed rest in peace! Speedy recovery I wish all those who are hospitalized. And now for some reality 101. I was listening to the news this morning when they were doing the news paper headline reviews. Some persons called in condemning the police and the state government for being too quick to allege that the heinous crime was perpetrated by Drug barons who are natives of Ozubulu. According to the majority of these callers, the rushed allegation smacks of a cover up. They preferred to be told that this dastard act was committed by either boko haram or the Fulani herdsmen. So much for religion and ethnicity. The truth is that the church and the community suffered in the Ozubulu massacre because they dodged their responsibility of correcting and standing against what is wrong #ItTakesAVillage. The church had the greatest responsibility and yet it floundered. Maybe that is why it was used as the stage for the Ozubulu massacre. The society now celebrates evil provided it comes with money. Recently, a flamboyant affluent young man whose source of wealth remains officially unknown was being analyzed. You need to see the amount of people saying things like "I DONT CARE IF HE DRINKS BABY BLOOD", "THOSE QUESTIONING HIS SOURCE OF WEALTH SHOULD SHUT UP ABEG", "MONEY IS KING AND LORD". ETC. I will not bore you much with more examples because most of us are already familiar with the drill. You can see just two of such threads here: EXAMPLE THREAD ONE and EXAMPLE THREAD TWO. Your son was brutalizing people everytime. Also remember that until parents, churches, etc reclaim their responsibility of speaking out against evil without fear or favour, they can never dodge the consequences of their laxity! Rip to those massacred in ozubulu and may God grant those they left behind the fortitude to bear the loss. Have a blessed week.